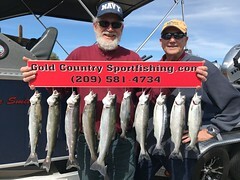 New clients Kim and Carl were onboard with me on Thursday August the 16th at Don Pedro in search of kokanee and rainbows. We met up at the lake, launched the boat and headed out. The fishing has been really good and today was no different as soon as I set the four rods fishing it was only a couple of minutes and the starboard side rod was bouncing and within a minute it was in the cooler. 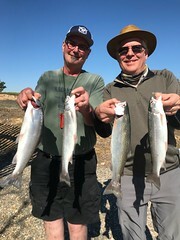 This day we had steady action and the company was great with limits of kokanee even I was able to have a limit of kokanee for myself, they also had 7 rainbows. A great day with a couple great guys. Thanks again!!!! 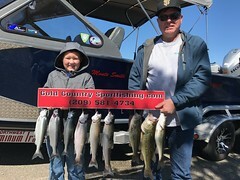 This entry was posted in California, Don Pedro fishing guides, Don Pedro Lake, Gold Country, Gold Country Sport Fishing, Kokanee, New Melones fishing guides, Rainbows. Bookmark the permalink.